Web application technology is a great means of channelling key information to important target audiences. For instance, the web app we designed and developed for the international automobile manufacturer Citroën was intended help the firm manage and distribute marketing materials such as high quality photographs and videos. 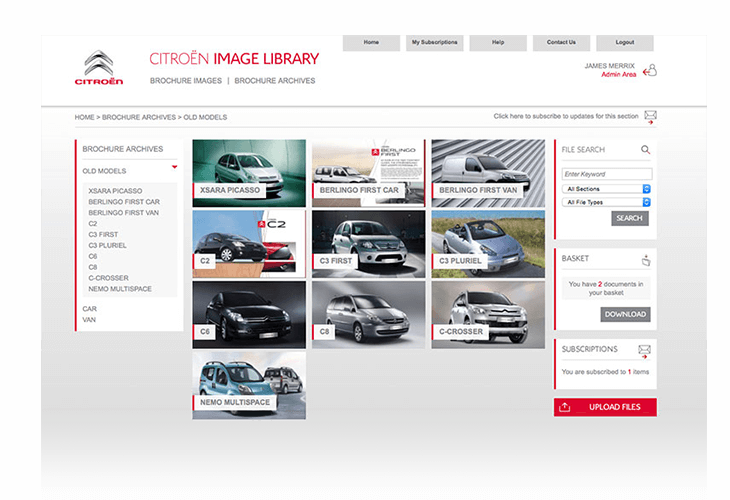 The Citroën Image Library Web Application collected, stored and displayed these key assets in an rationalised, accessible and attractive manner. The web app system enabled Citroën to create user groups such as Citroën marketing, agencies, dealers and leasing companies – creating huge flexibility in terms of data distribution and sharing. Through the web application’s admin system, Citroën can select the precise folders to which user groups have access. They can also set specific dates for scheduled access. Likewise, web app users can subscribe to categories – like a car model – and receive email notification whenever relevant new files are added. Citroën now have the ability to distribute quality marketing materials to the required users, fast – all using a simple web application. Application development starts with a conversation. All our app projects are shaped around the customer.